Questions? Talk to a Building Expert. Call us now at 800-345-4610. The Steel Building Destination for Millions Your Project is Our Project. Americans trust Armstrong Steel everyday. Here are some of their stories. "Every time I've shown up to Armstrong Steel's Headquarters in the Denver Tech Center to discuss a building project with the project managers they are accommodating, efficient, priced right and they take care of our needs." "I really appreciate Armstrong going out their way to educate me and offer assistance in many areas - concrete drawings, erector quotes/offers, and CAD drawings...I hope all is well and really appreciate all you have done to create/deliver the building we always wanted. God Bless!" "Just wanted to thank you for all your help and follow-through with my building plans. Got the permit and foundation work has started! Thank you again!" "I was very happy with the timely service I received from Armstrong Steel. I ordered my building the end of July, and it was delivered when I requested. I was amazed how nicely the building went together, no problems at all! I work inside my Armstrong building - it's obvious how strong and beefy Armstrong Buildings are. I am very happy with my purchase and would recommend Armstrong Steel to anyone who is in the market for a metal building." "I would speak to any of your new customers about our experience with Armstrong! You guys have really solidified your business with us." "I can't thank you enough for all your help with this - the designs, the plans, the engineering etc. This is what we were hoping when we decided to go with Armstrong - and we sure are pleased and thankful. I have a good feeling other people will move in this same direction as us with your company - and we'll have laid important groundwork and precedent." "Our contractor and his crew were able to assemble our building in about 10 days. All of the components were accounted for and we were very pleased that there were no missing parts, even down to the smallest detail." 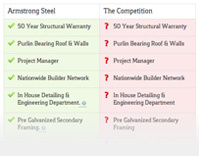 "Armstrong Steel was by far the best steel company to deal with. There was no high pressure sales, no nagging phone call. I just told them what I was looking for and they got back to me within 24 hours with a very competitively priced package. Everything was very straight forward and simple, from the ordering to the shipping and on thru the completion of the project. Nick and the rest of the guys at Armstrong made this project go smoother than I could have ever imagined." "He was so happy with the building, he took the boys to lunch and then asked them to supper and bought them steaks and beer. God bless and have a great 4th of July holiday!!" "Just thought I'd let you know the building is up and it looks absolutely freakin' gorgeous! My county inspector has a Morton Building, he's had problems with it now for the last ten years and he was shocked at how sharp my Armstrong building wound up. Even my neighbor walked over and went 'Oh my God!'. Thank you!" "The church building is going great so far. Thanks for all your help, Armstrong!" "Thanks for your help! You guys just keep coming through for us and we want to give you and Armstrong a public pat on the back. It appears the contractor will be staging equipment to start work in just a few days. We are all excited that in 60 days our church will be up and we can begin on the interior. I will be sending photos as we go. Thanks again!" "Our building looks great! It was so easy to erect and I love the stability and overall quality of my Armstrong Building. My builder looked inside after completion and asked, 'Where did you get this building?!'. You guys hit a home run with your product. Thanks Armstrong!" "I expected my Armstrong building to be high quality, but after actually unloading the building and seeing the structure, which went very well and with no damage, I was just really impressed. I'm not going to have problems selling Armstrong buildings!" "We are so impressed with how sturdy our Armstrong Building is! The shipping department was a pleasure to work with and always answered the phone when we called with a question. We're really glad we didn't cut corners and went with Armstrong's commercial insulation package as it is staying quite warm in our building as temperatures begin to drop here in Salida, Colorado!" "When my customer needed a steel building, I went to Armstrong Steel, they were helpful, courteous and got the building designed and delivered on time. The detailed drawings were easy to read and all the material arrived accounted for. When I had questions during the installation process, Armstrong Steel was there to help, all the way. 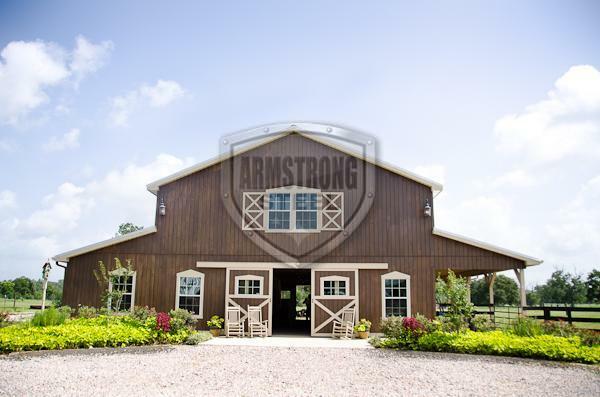 I would use Armstrong Steel again to design and supply my next customer's new steel building." "Everyone at Armstrong does exemplary work and is so nice and helpful. We also want to say how much we enjoyed working with our project manager. He is very knowledgeable in so many areas and was wonderful to work with. The local company in Bastrop, TX that we hired to erect the building couldn't have been more complimentary about the quality of the building and the ease in which it went up. They were so impressed with the structure! The building is exactly what we were hoping for. Thank you from the bottom of our hearts for a job so well done! We would highly recommend you, your company, and all of your employees to anyone looking to purchase a steel building. It was a pleasure to work with you. We can't put into words just how much we love our finished Armstrong Building! The covered porch and the rest of the building turned out beautifully. Armstrong Steel did an amazing job! All of the work was done with such care, skill, and precision. When a few panels showed up the wrong length, Armstrong Steel was so quick about getting new replacement panels on site. It all went smoothly and we're glad we chose Armstrong Steel. Thanks again." "Timing was an extremely important factor for us and we knew no one in America could get a steel building on site quicker than Armstrong Steel - so the choice was easy. We needed an open structure to use for a food pavilion at our waterpark in Waco, Texas. Armstrong Steel came through and got us our building in time for our Grand Opening ceremony. The quality of the building blew us away - especially considering they had the lowest price. Literally, they came in at about half the cost of everyone else. We expected it to be easy to erect but, wow! It was a breeze! The quality of the building was beyond anything we anticipated and the pre-galvanized secondary framing was impressive. With all of the unscrupulous steel building companies out there today, we're glad we chose Armstrong Steel because we got what we paid for and THEN some AND they came through in a pinch!" "The buildings I ordered are of very good quality and we are pleased with both buildings - They look great! Armstrong's employees always treated us with kindness and respect when we had questions or issues and attempts were always made to resolve our concerns or answer our questions. That sure goes a long way. Thanks guys!" "I'm extremely pleased with the way my Armstrong building turned out. I purchased my building with rigid frames at all locations. I highly recommend this option for ease of assembly, versatility and strength. This is the third steel building that I have assembled myself. (I did not give the previous suppliers a recommendation.) The detailing on the building was top notch. Kitty in the shipping department was a pleasure to work with. The building was delivered just as they promised. I rate this as an excellent building experience!" Read more about some of the buildings that we've delivered. Get Started Now! Price a Building! Or call 800-345-4610 to speak to a Building Expert. "Timing was an extremely important factor for us and we knew no one in America could get a steel building on site quicker than Armstrong Steel so the choice was easy. The quality of the building blew us away especially considering they had the lowest price." "I decided to go with Armstrong Steel to buy my 60' x 120' x 16'. I am very pleased with Armstrong Steel and would recommend them to anyone!" "I cannot remember the last time that I received customer service like I have from Armstrong Steel. Everything went smoothly and you guys did everything we expected of you. We'd recommend Armstrong Steel to anyone building a manufacturing facility!" "Armstrong Steel was by far the best steel company to deal with. There was no high pressure sales, no nagging phone call. I just told them what I was looking for and they got back to me within 24 hours with a very competitively priced package." "The people putting up the building, Able Construction, said this is the best engineered building they have constructed and they have put up 150 to 200 buildings." "Thank you from the bottom of our hearts for a job so well done! We would highly recommend you, your company, and all of your employees to anyone looking to purchase a steel building. It was a pleasure to work with you." "I was most impressed with the overall quality of the materials to be provided, the attention to detail by Armstrong engineers, and the design help provided. People who see the barn comment on the quality and appearance and ask me, 'who built your barn?'" "I am very satisfied and would use Armstrong again. Patco said they had never seen a building go together so well. They said 'it was clear the engineers spent a lot of time developing it.'" "I couldn't be happier with Armstrong Steel...they have been there for me every step of the way." "We sent a deposit to a well-known company who we later learned had an established reputation for stealing people's deposits and not delivering buildings. Huge mistake. We never got our building and they still have our money. Our first call should have been Armstrong Steel." "You folks are great, extremely willing to work with your customers and I would recommend you to anyone thinking of purchasing a steel building." "I'm extremely pleased with the way my Armstrong building turned out. I rate this as an excellent building experience!" "My contractor and I would recommend Armstrong Steel if you are considering a steel building for any of your needs." "The quality of my Armstrong Building was excellent. I recommend them for any steel building needs." "We are so impressed with how sturdy our Armstrong Building is! We're really glad we didn't cut corners and went with Armstrong's commercial insulation package as it is staying quite warm in our building as temperatures begin to drop here in Salida, Colorado!" "I expected my Armstrong building to be high quality, but after actually unloading the building and seeing the structure, which went very well and with no damage, I was just really impressed." "My builder looked inside after completion and asked, 'Where did you get this building?!'. You guys hit a home run with your product. Thanks Armstrong!" More information for people interested in a Steel Building and how Armstrong can help save them money. Armstrong Steel's Network is a unique collection of blogs, Facebook pages and Twitter feeds that cater to the needs and interests of contractors, first time builders, small business owners, pastors & church leaders, do it yourselfers and their families. *Since our founding, millions of contractors, purchasing directors, builders, small business owners, do it yourselfers, their families and others have found Armstrong Steel when searching for information and possible use of a steel building. **24/7 reps are on hand to provide limited assistance. Product support, project management and customer service reps are available 8am - 5pm weekdays, excluding holidays. For technical questions or support on building orders, please call back during this time. Copyright © 2019 Armstrong Steel. All Rights Reserved.